February 24, 2004: More pictures added to the Construction Gallery page, to show progress in Hudson and Marlborough. December 18, 2003: Thursday night, the Acton Community Preservation Act Steering Committee (CPA) held the first of 3 consecutive meetings to hear the 2004 CPA allocations. Acton Town Manager Don Johnson and Town Planner Roland Bartl presented the Assabet River Rail Trail funding proposal. It was very well received and everyone involved was confident that the committee will vote to include ARRT as a CPA line item in the April 2004 Town Meeting. The amount proposed will be $170,000. All of the ARRT volunteers who attended the meeting spoke, during the 'public comments' segment. Thank you for attending on such short notice! November 15, 2003: The Maynard rail trail cleanup today was a great success. 22 volunteers showed up and cleared the entire section between High Street and Route 117. Dead trees were cut down, 21 tires and 10 bags of trash were hauled out to the road for town pickup and all the leaves raked out between the old rails. Next Spring, we plan to spread wood chips between the existing railroad rails to make a temporary path that can be walked, jogged or used by mountain bikes. Ray & Sons Cyclery & Ski Shop and Welch's Food provided the refreshments. Flash!!! : S & R Contracting has been issued MassHighway's Notice to Proceed and trail construction started in Marlborough on September 29th!!! 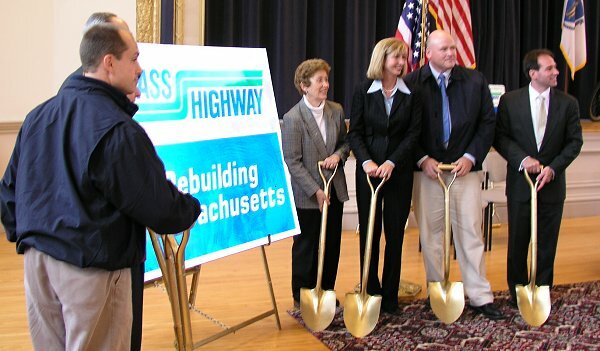 Sept 19, 2003: At the ceremony to mark the start of construction of the Marlborough- Hudson section of ARRT were Lt. Governor Kerry Healey, along with Transportation Secretary Daniel Grabauskas, MassHighway Commissioner John Cogliano, Rep. Pat Walrath, Sen. Pam Resor, Rep. Stephen LeDuc, Developer John Delli Priscoli as well as local officials from the 5 ARRT communities. The ground breaking was held inside the Hudson Town Hall because of tropical storm Isabel.